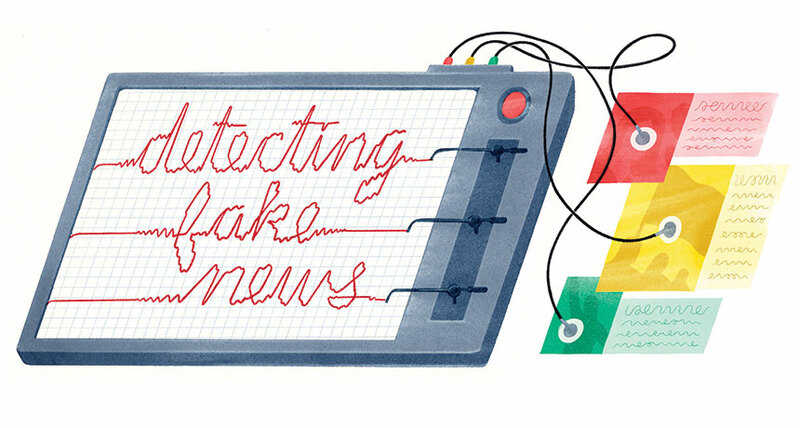 DECEPTION MONITORS Researchers are building online algorithms to check the veracity of online news. We live in a golden age of misinformation. On Twitter, falsehoods spread further and faster than the truth (SN: 3/31/8, p. 14). In the run-up to the 2016 U.S. presidential election, the most popular bogus articles got more Facebook shares, reactions and comments than the top real news, according to a BuzzFeed News analysis. Before the internet, "you could not have a person sitting in an attic and generating conspiracy theories at a mass scale,"" says Luca de Alfaro, a computer scientist at the University of California, Santa Cruz. But with today's social media, peddling lies is all too easy - whether those lies come from outfits like Disinfomedia, a company that has owned several false news websites, or a scrum of teenagers in Macedonia who raked in the cash by writing popular fake news during the 2016 election. Most internet users probably aren't intentionally broadcasting bunk. Information overload and the average Web surfer's limited attention span aren't exactly conducive to fact-checking vigilance. Confirmation bias feeds in as well. "When you're dealing with unfiltered information, it's likely that people will choose something that conforms to their own thinking, even if that information is false," says Fabiana Zollo, a computer scientist at Ca' Foscari University of Venice in Italy who studies how information circulates on social networks. Intentional or not, sharing misinformation can have serious consequences. Fake news doesn't just threaten the integrity of elections and erode public trust in real news. It threatens lives. False rumors that spread on WhatsApp, a smartphone messaging system, for instance, incited lynchings in India this year that left more than a dozen people dead. To help sort fake news from truth, programmers are building automated systems that judge the veracity of online stories. A computer program might consider certain characteristics of an article or the reception an article gets on social media. Computers that recognize certain warning signs could alert human fact-checkers, who would do the final verification.